Low prices. OrangeSmile.com offers car hire service in Emirates on the lowest-rate-guarantee basis, since we work with car suppliers directly. For your search criteria in Emirates, we always select and show the best rental offers. The car reservation process consists of 3 simple steps: (1) search for available cars for your dates in Emirates; (2) select your car type; and (3) fill in the booking forms. Once the reservation is completed, you will receive a confirmation voucher to your email address. During the booking process, please check your rental conditions. To pick up your car at the rental point in Emirates, you need to provide our confirmation voucher, your driving license and a valid credit card. The final payment is normally carried out at the pick-up point. Our car hire points in Emirates accept VISA, MasterCard, etc - please check your rental conditions. At the pick-up point, please read the handling manual and check the car for present defects. OrangeSmile.com wishes you a pleasant journey to Emirates! The car hire reservation system OrangeSmile.com allows renting a vehicle in Emirates within 10 minutes. Our largest database of car suppliers enables us to provide you a rental car in Emirates at the cheapest rate ever possible. At rental locations in Emirates we offer the following car sizes: mini, compact, economy, standard, premium and luxury. The following car types are available in Emirates: Sedan, Hatchback, Jeep, Cabriolet, Coupe, Minivan and Minibus. 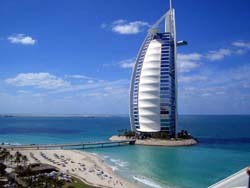 The United Arab Emirates remain one of the most famous and popular resort destinations in the world. The country welcomes guests all year round. Each from the 7 Emirates is famous for its own landmarks, excursions and entertainment. One can see the Arabian culture in its full splendor during a visit to Abu Dhabi, the capital of the country. The city simply amazes travelers with its lush greenery. Here, among beautiful parks, you will see luxury palaces, old forts, modern skyscrapers and entertainment centres. Fans of shopping are recommended to visit Dubai, where they will find the biggest market in the UAE. As much fine jewelry is sold on this market, it has become widely known as the Golden Market (Gold Souk). Besides that, there are also several important architectural landmarks in Dubai, such as Sheikh Mohammed Palace, Jumeirah Mosque and other ancient buildings. In Sharjah you will see the beautiful Cultural Square and unforgettable Pearl Monument. There are also several large bazaars, restaurants and entertainment centers in this Emirate. The Al Ain Emirate is famous for its natural landmarks. Besides nature reserves and national parks, there are several beautiful botanic gardens in Al Ain, as well as a large zoo. Actually, ordinary city streets look like a big blooming garden thanks to numerous flowerbeds and many exotic flowers. Dreamland Aqua Park, which is located in Umm Al Quwain, is known as one of the most famous entertainment parks in the country. Rich choice of attractions, playgrounds for kids, swimming pools and parks zones for picnics have made this park very popular, so it attracts hundreds of visitors every day. There is also a theater in the aqua park, so besides thrilling rides visitors are welcome to attend various performances and concerts that take place there every day. Wild Wadi Aqua Park is no less popular. This park is located in Dubai and is particularly famous for the Kamikaze ride - the 15 meter high ride ends with a giant swimming pool. Beautiful waterfalls, unhurried rivers and swimming pools with artificial waves make Wild Wadi the best place for rest during a hot day. When describing architectural landmarks of the UAE, it's simply impossible to forget to mention Hatta Fort that is located in a small village. Even several centuries ago the fort was a very important protective facility. Nowadays, travelers are welcome to know more about the history of the fort in a local museum. Modern buildings are no less interesting and are also worth close attention as some of them really deserve it, for example, Burj Al Arab – the most luxurious and expensive hotel in the world. Before making a reservation, please read the rental conditions of your chosen car. This will help to avoid unpleasant surprises at the rental office in Emirates. The damage to the car body, wheels and windows, caused in non-accident situation, is not covered by the CDW insurance package. These damages can be insured at the rental office in Emirates, by ordering a complete coverage package.